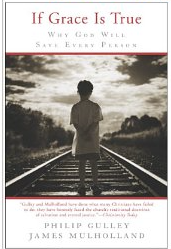 Gulley, Philip; Mulholland, James “If Grace Is True: Why God Will Save Every Person”. HarperCollins. Kindle Edition. These and many other words like them from Philip Gulley speak to my heart. I too have come to stubbornly recognized their truth. God speaks to all people and no one group is his “favorite”. Like Mr. Gulley I was brought up to believe that all those other religions and even those versions of Christianity different from mine were all going to hell as we were the only ones who got it right. We were the chosen few that God selected to be with him for an eternity. All those others would leave this earth to an eternity of suffering and anguish. It was kind of nice to think that at least we had it made and that our eternity was assured. But what about my good friend down the street who went to a different church than me? What about another friend who didn’t go to church at all! Would they suffer like nothing I could imagine? Why is God lacking mercy for them? These types of questions tormented me even as a youth. Later in life I belonged to a Christian denomination that believed in a 100% literal Bible. To them God had absolutely nothing more to say about his relation to us. It was all in the Bible and nothing else could be added. They seemed to be stifling God by saying that he does not speak to us today. That reminds me of the question a young child said in a recent post here. “Why does Jesus want us to talk to him when he says nothing in return? The biblical inerrancy part troubled me even more. I read words in that document that seemed to say the opposite of what I was told was the absolute truth. When I started publicly voicing my questions I was figuratively shown the door. The clerical leader did not want me to poison his congregation with my heresy. I have matured greatly as a believer in God since those years. I see a God who loves us all and wants all of us to be with him. I finally see that no one has a lock on God and what he is…… We all have in wrong in one degree or another. No one can really know the unfathonable heart of God. We are human, how can it be otherwise? I am convinced that some clergy have truly ” missed the boat”. Their ears are closed to hearing your questions as they wear blinders. There is nothing you can do, but pray that the Holy Spirit will come into the congregation to show them the way.